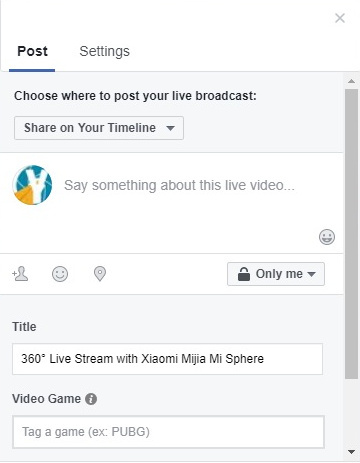 Here are some informations to live stream your Xiaomi Mijia Mi Sphere or Madventure360 camera on YouTube, Facebook and Periscope. I won’t say it is perfect, but it works on some conditions. This tutorial is for Windows 10, although it can work on a different OS but you will need to adapt yourself. Though I tried to make it understandable to everyone, you will need coffee or tea if you are not familiar with typing cryptic commands. Before going further one condition is absolutely required for this hack to work: you will need two connections at same time, a wireless connection to get your camera stream input and a wired connection to your router to stream the ouput to Youtube. If your PC cannot meet this condition, this tutorial already ended for you. Download and install ffmpeg a way it is available on your path. I provide a compiled version of software into xiaomi-misphere-live.zip but if you want to work with source, install Windows Linux Subsystem. The first step is to connect your PC to the camera. Be aware the camera IP address is fixed with 192.168.42.1 mask 255.255.255.0 thus if your network already use the same address space 192.168.42.x you won’t be able to connect and you will need to change your router address. 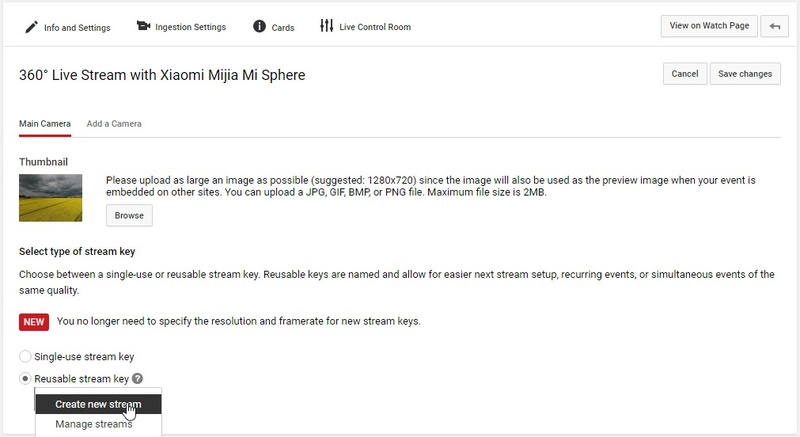 Power on the camera, enable WIFI on your PC, browse through WIFI connections and search for a SSID starting with MIXJ- it is your Xiaomi Mijia Mi Sphere Camera. The default WIFI password: 12345678. Once you are connected you can check the live stream of the camera is available. You will probably notice the live stream of camera is the dual fish eyes and is not the full resolution of camera but is limited to 720p/60FPS. Before streaming to YouTube one needs to stitch the dual fish eyes into equirectangular projection in real-time. As you already stitch video with Xiaomi Application you know this operation consumes a lot of CPU power. To achieve the same in real-time we will use a trick, the remap function of ffmpeg. The principle of ffmpeg mapping is to use original pixels from video source and map them at specific positions into video output. Using remap we can emulate a equirectangular projection using a pre-calculated map at a much faster rate. map-misphere-1280×720-x.pgm, map-misphere-1280×720-y.pgm for stitching camera live stream for youtube. If you want to create your own maps you will find more informations at the end of this post but is not needed at this point. Now you are ready to check the real-time stitching of the Xiaomi Mi Sphere camera. Open a windows command and stitch live stream with a first command. For each scripts I give two options depending on your Graphic Card. If you own a NVidia Graphic Card then you can use the Nvidia NVENC. It is a feature that performs video encoding on your graphic card, offloading this compute-intensive task from the CPU. On other case you will use the more generic x264 encoder of ffmpeg. If you are not sure try first with NVENC and if is failing use the generic x264 encoder. This will create a stream on port 1234. You can live stream 360° video in Youtube only into events, no idea why. The 720p equirectangular format should be 1440×720 but Youtube is waiting for a non 360 video standard format of 1280×720 (which is odd but I guess this point can evolve in future). If you don’t scale the video to that format you will get this warning message on your YouTube Live Dashboard : Please check the video resolution. The current resolution is 1440×720, which is not optimal. The live stream of your camera has no sound but Youtube is waiting for the video to have sound. 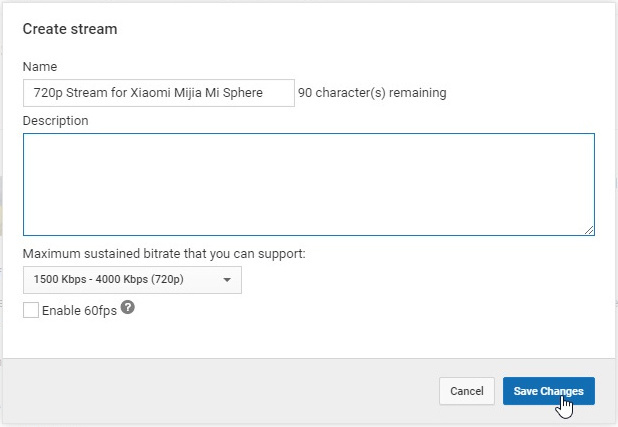 If we stream the Xiami Mi Sphere stream directly to Youtube it won’t be accepted, but this time no warning message will help you. You will see your stream going up and after a few seconds going down again without any explanation. Took me time to figure out the cause of issue. Depends if you want to stream in Youtube or Facebook prepare your stream according. Go to Youtube Creator Studio, on Live Streaming, select Events, click on Schedule a new event. Into Basic information enter a Title is required, you will probably want to make it private for the first test and select Private then select Custom (more encoding options). Youtube should give you a key something like “5yak-evg2-m1fp-3031”, write down that key you will need later to modify the streaming batch. Your Youtube Stream is ready to receive video stream. Go to Facebook Live. Click on Create Live Stream button. Into Post set the title of your Live Stream, you will probably want to make it private for the first test and select Only me. Into Settings click on 360 Video and enable This live stream is a 360 video. You should see the screen Connect Your Live Stream to the Live API now. 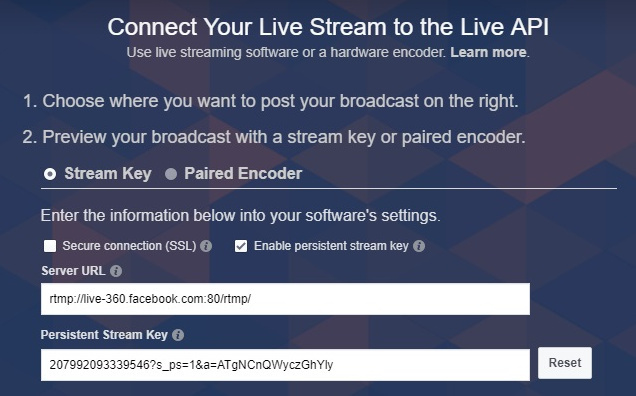 Facebook should give you a key something like “207992093339546?s_ps=1&a=ATgNCnQWyczGhYly”, write down that key you will need later to modify the streaming batch. Periscope should give you a key something like a server url and “skzvf4az6w25”, write down that key you will need later to modify the streaming batch. Set your personal stream key by modifying STREAM_KEY variable. 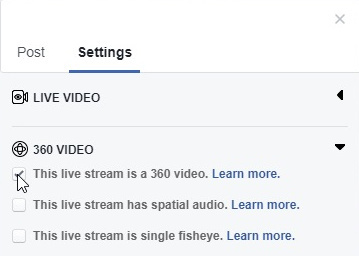 If you followed me until this point, launch the command and you should be in live with a 360° stream in youtube, facebook or periscope and yep is 360° ! This chapter give extended information if you want to create your own maps. We will use dualfisheye2equirectangular software developped by raboof to convert ‘dual-fisheye’ 360 image material to equirectangular. You can compile the projection program typing this command on Windows Linux Subsystem, or skip this part if you trust the .exe I’m sharing. This will create projection file. Still using Windows Linux Subsystem, type this command. Modify the value of the -b (crop) parameter of projection into the batch file maps-create/create-maps and type this command to create equirectangular projection. Check the picture with four favorite 360 viewer. Once you are satisfied with the result you can go to next step. Hope you enjoyed this tutorial, any comment is welcome. For more information about Xiaomi Mijia Mi Sphere visit the Ultimate Resource Page of Mic Ty. Great work Dude!! Will do this asap. This looks great. Just what I need to use this cam as a 360 degrees CCTV cam p on an existing pole above my house while the camera is tethered to a USB for power. One question though: could the ffmpeg mapping function be used to create tinyplanet type images? Do you have any experience with this? Hi Cedlee, I haven’t found a tool to create map to stream a tiny planet on live with ffmeg. Though theorically must be possible. Have in mind also having the Mi Sphere connected through wifi makes the camera heat quite a lot, I wouldn’t advice to have it connected 24/7 this way. hi, do you know what extension does said ip (rtsp://192.168.42.1:554/live) export?, i’m trying to use it on java/opencv and it doesnt work, doesn’t it have a mp4/img type? The stream address is rtsp://192.168.42.1:554/live no extension, you cannot change it.